Sales promotion in Our webshop! 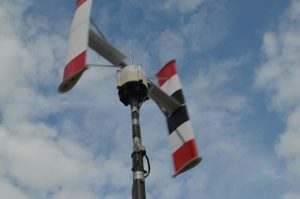 We recommend the 2 wing economical H-rotor, and although in theory this is not 100% self-starting – as can be proven in a wind tunnel – it always starts on all the real sites we tested. The construction manual can be found here. Combined with our custom-made 12V generator, the turbine is designed to reach battery charging voltage at about 120 to 150 rpm which is reached at a wind speed of around 4m/s. Kit for 1 meter height, including arm support for 1 meter diameter blade. You need to assemble the blade yourself (easy assembly). Weight: 4 kilo each, the blade includes the support arm! A hub for 3 blades; the center hole of the hub fits a 20mm axle. A hub for 2 blades; the center hole of the hub fits a 20mm axle. Or use the form in our contact page.